As a scholar of zombie fiction, one tends to get hung up on one’s specific method of dealing with the shambling dead – prefer a gun, a baseball bat or rather a sword? Academically speaking that means that once you look at the hordes of undead roaming in popular culture with an eye for consumerism, you find anti-capitalist notions everywhere. Do you have a thing for the dehumanization of refugees, the colonized, and the poor? Here you go, lots of zombie fictions to cater to your taste. It is easy to get mono-theoretical with these ever-present cyphers for our 21st century lives and forget that zombies are indeed valuable to process a wide variety of cultural anxieties: they are “good to think with” (77) as one essay in The Walking Med: Zombies and the Medical Image states. So it is quite possible that you have not thought about the connections that the essays of Lorenzo Servitje and Sherryl Vint’s anthology draw upon, between medical discourses, graphic literature and the zombie. That zombie fictions establish a link with medical discourses seems a simple enough starting point, as viral outbreaks inform not only films such as 28 Days Later or Resident Evil, but also one of the most popular graphic novel series today: The Walking Dead’s central tenet, “we are all infected,” infuses the narrative with questions of modern medicine and manageable diseases. But far more than discussing simple cause-effect-relations or metaphors of virology, the anthology wants to open up an interconnected field of medical discourses that the zombie speaks to, especially in its graphic representational form: “The project of this book, is …” write the editors in their introduction, “to consider what new things it [the zombie] might signify in the context of contemporary for-profit healthcare, dehumanized working conditions … and biomedical protocols” (xiv). And indeed, the essays are breaking new ground in the interpretation of the zombie as a figure to think with: representations of specific medical diagnoses, conditions within the medical profession, or social stigmata related to illness. 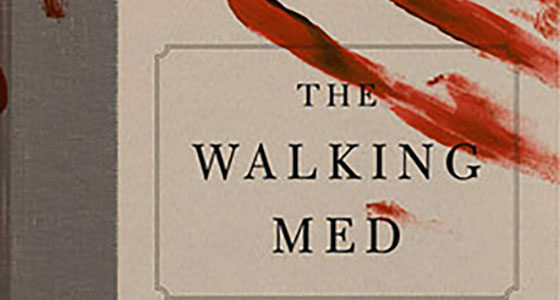 In addition to the innovative connection of medical and zombie discourses, The Walking Med further introduces readers to the idea of graphic medicine, a field that deals with graphic literature as a way to illustrate mainly medical practice and autobiographic experiences of patients. The cross-section of all three discourses is a valuable addition to the research going on in each field, but has heretofore never been connected. As such, the volume is an immensely important venture in the kind of interdisciplinary research that we as scholars so value in science fiction itself – a view that estranges us from our reality and helps us appreciate a known object from unknown viewpoints. Servitje and Vint bring together researchers from cultural studies (looking at the zombie as a metaphor) and those working in graphic medicine (using visual texts for medical purposes) by challenging each of them to new perspectives. The result is a volume that expressly moves beyond the boundaries of each perspective, with the nine essays being separated into three parts. The first section, “Diagnosing Zombie Culture” examines and reimagines works of graphic literature from popular culture with an eye towards the discourses of graphic medicine. This is especially fruitful in Gerry Canavan’s text on “Geriatric Zombies”: The medical lens allows Canavan to analyze mass-distributed comic series from DC and Marvel as allegories for treatments of aging, disability and infirmity. Series such Blackgas, Blackest Night, Marvel Zombies portray characters shifting uncomfortably from normalcy and ability towards a loss of cognitive and bodily control, echoing discourses on “progressive and degenerative conditions that strike the elderly” (18). These new narratives, Canavan shows convincingly, reveal a drastic need for renegotiation of how we treat senescence and disability in that they portray zombies with subjectivity, struggling with an involuntary loss of humanity. Rounding out the chapter are two less disease-specific re-readings of the zombie as metaphor in both the essay by Kari Nixon and that by Tully Barnett and Ben Kooyman. The essays discuss zombie fiction as representations of conditions in the healthcare system, in the first case in regards to access to health care and the virtual indistinction between those infected/not-infected, and in the other case in regards to critiquing how medical knowledge and access to medicine is based in class divisions. The second section of the anthology, “Reading the Zombie Metaphor” turns its attention to graphic medicine and approaches these texts with regard to the cultural impact on the zombie figure. Especially interesting and most acutely different in regards to methodology is the chapter on “Zombies, Comics and Medical Education” by Michael Green, Daniel George, and Darryl Wilkinson. With Green being an MD teaching bioethics to medical students, the chapter lacks a distinct cultural studies approach but instead offers a best-practice report about Green’s teaching of “Comics and Medicine”, a course in which students draw their own comics of their challenges in medical education. Green and his colleagues are able to distill several zombie tropes from the self-depictions and storylines drawn by his students, and thus connect them to their experiences and the more “dehumanizing aspects of medical education” (100) such as isolation, mindless consumption, herd mentality and the loss of empathy in the process of their becoming an MD. In addition to this essay, Juliet McMullin’s text on “Zombie Toxin” traces the categorial multiplicities of chemicals connected to cancer, either as cure or cause and its impact on the conception and representation of life/death in graphic medicine. Sherryl Vint’s essay on “Zombies and Public Health” then discusses the cultural conflation of contagion and zombies that the CDC comic Preparedness 101: Zombie Pandemic has helped to entrench and how the indiscriminate violence against zombies can all too easily be applied to “dehumanize victims of virulent outbreaks” (140). Lastly, the third part of The Walking Med opens up the discourse of zombies and graphic medicine to include a “longer history of the study of visual culture in medicine” (xxi) and presents three essays that push beyond the cultural work of graphic novels and zombies. Sarah Juliet Lauro, for example, argues that corpses are “Zombie Objects” (151), linking them via the medical histories of anatomical models to the representation of fictional zombies in the artworks of George Pfau and thereby revealing their ontological work as non-living subjects. Lorenzo Servitje’s chapter on “Objectivity, Medical Visuality, and Brain Imaging” discusses a novel by Steven Schlozman that revisits anatomical drawings and pre-digital knowledge technology via the zombie narrative in order to critique the discourse of neutrality and impartiality involved in digital neuroimaging. And lastly, Dan Smith discusses the figure of the zombie as a boundary in an autobiographical comic about the pathology and recovery from anorexia. In all, the anthology is one of the most innovative and interdisciplinary approaches to a cultural phenomenon so prevalent today as the zombie. Instead of retreading methodological pathways of literary analysis, the editors have done a remarkable job in guiding their contributors towards new and challenging perspectives on the subject. For anyone wanting to shake up their own trodden paths of research or teaching with regards to the zombie, I wholeheartedly recommend a deep and thorough look into this book for inspiration. Servitje, Lorenzo, and Sherryl Vint, eds. The Walking Med: Zombies and the Medical Image. University Park, PA: Penn State UP, 2016. xxiii + 264 pp., $74.95 hc and $29.95 pbk. Im Original erschienen in Science Fiction Studies. “New Ways to Think about Zombies: Lorenzo Servitje and Sherryl Vint, eds. The Walking Med: Zombies and the Medical Image.” Science Fiction Studies 44.3 (2017): 623-25.